Short-beaked common dolphins are about 80-90cm long, at birth. Adults can grow to 2.5m long, but average size is about 2.2m. Average weight about 150kg, but may weigh up to 200kg. There are 41-57 pairs of small, sharp, pointed teeth in each jaw. Lifespan is, at least, 25-30 years. This species is characterised by a dark brownish-grey back, white belly and an hourglass pattern on the flank coloured yellow between the eye and the dorsal fin and light grey between the dorsal fin and the fluke. The dorsal fin can range from completely dark to almost entirely beige, but most often have a small light patch in the centre. There are some individuals that appear to have not developed the colour yellow on their flanks and are completely dark where the colour yellow should be. They feed mainly on epipelagic schooling fish and squid. Foraging dives as deep as 200m have been recorded. 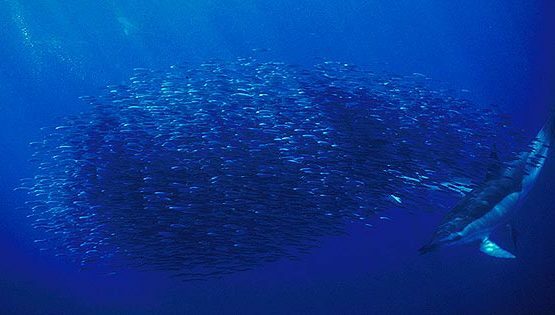 In the Azores, they seem to live in medium-sized groups (30-50 individuals). The group sizes and composition varies according to their behaviour and the abundance of food. 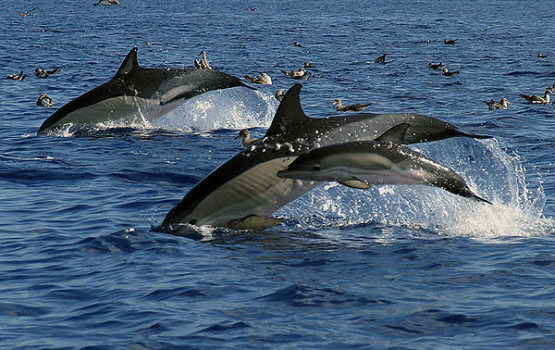 Sometimes they associate with other species and we occasionally spot them in mixed groups with striped dolphins (Stenella coeruleoalba), Atlantic spotted dolphins (Stenella frontalis) and bottlenose dolphins (Tursiops truncatus). Gestation lasts for 10-11 months. Calving intervals are reported between 1-3years. They often bowride vessels, however when the group composition includes a high number of calves they sometimes avoid the boats. It is a worldwide distributed species. 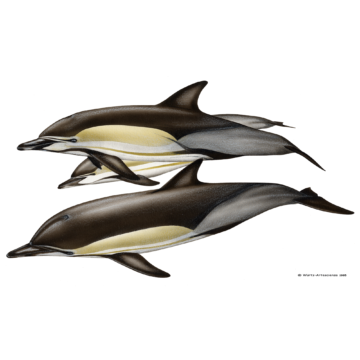 Its range overlaps with that of long-beaked common dolphins (Delphinus capensis). This later species is characterised by a longer beak, slender body, a more muted colour pattern, a wider chin-to-flipper stripe and a reduced tendency to have beige patches on the dorsal fin. 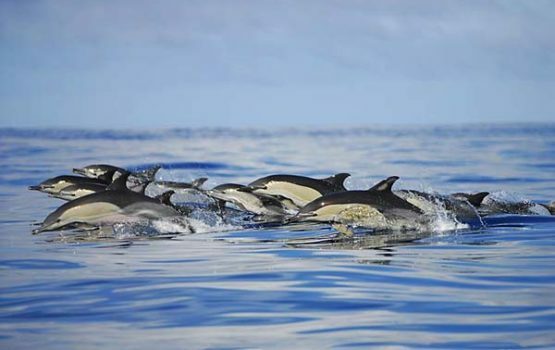 Until now, the long-beaked common dolphin is not registered in the Azores. Short-beaked common dolphins are resident in the Azores, and we observe them, on average, in 65% of our trips; making them the most frequently sighted cetacean species in the south of Pico. Although they are present year-round, they are more frequently encountered in the spring (March-June) and the frequency of the sightings decrease in the summer months (July-September). This pattern is observed every season and can be explained, perhaps, due to the appearance of Atlantic spotted dolphins in huge numbers, increasing the competition for food.